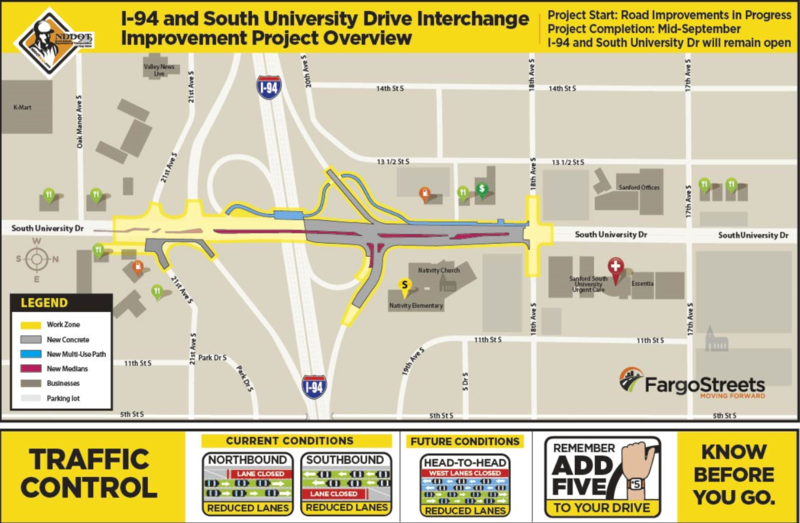 Early next week contractors for the Interstate 94 (I-94) and South University Drive Interchange and Road Improvement project will begin the next phase project work by shifting traffic onto the existing pavement on the west side of the work zone. Crews will begin removing the east side of the roadway to begin infrastructure improvements underneath the roadway next week. Work on the east side will take about two months to complete underground and paving operations then traffic will shift to the newly constructed east side roadway to begin the reconstruction of the west side of South University Drive and ramp improvements. Access onto to South University from I-94 and business driveways off of South University will remain pen for use of the traveling public. Traffic is currently reduced to two southbound and northbound lanes as crews continue with median removals throughout the project limits. Crews are working close to moving traffic in the middle during removals and installation of temporary asphalt. On Saturday, May 19, from 6 – 6:30 a.m. crews will remove the overhead sign structure north of I-94 on South University Drive. During this time there will be flaggers present to help direct motorists until the sign is safely removed. Current Conditions – Two lanes of traffic are open to motorists in each direction. Access onto to South University from I-94 and business driveways off of South University remain open for use. 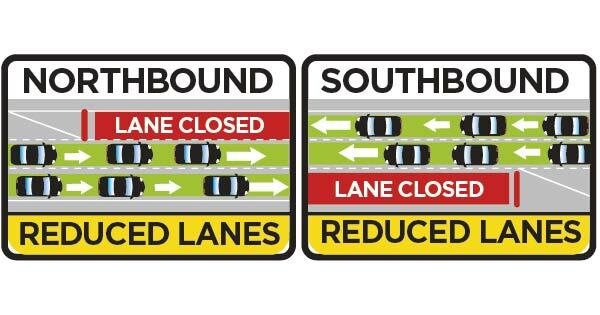 Future Conditions – Week of May 21 – motorists will shift to head-to-head with two lanes in each direction on west side of South University Drive in Fargo Access onto to South University from I-94 and business driveways off of South University will remain open for use of the traveling public.